Durable heavy gage steel construction for years of service. Durable powder coat to hide fingerprints. Scratch and stain resistant too. Packaged in UPS-able corrugated box. No assembly required. 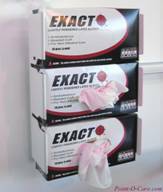 Hold any common canister with wipes ready to use with one-handed dispensing. Holds all wipes canisters from 3" to 5-1/2" diameter. Push in full canister and simply pull to remove when empty. When your canister size changes, so does the Canister Holder. Realize significant cost savings by avoiding purchasing and installing unique brackets for each canister shape now and when they change later. The Front Load Adjustable Wipes Canister Holder profile conforms to the shape of your canister to minimize space requirements. No adjacent space is needed on congested walls and rails. No tools required for size adjustment. Constructed of durable powder coated aluminum for easy cleaning and longevity. Available in neutral color wall mount, pole mount (1" to 1-1/2"), and Fairfield rail mount. Patented Product. True front loading means no additional space is needed above, below, or beside for replacement of glove boxes. This glove box holder is perfect for crowded work and scrub areas where space is at a premium. Wall space utilization is increased for greater efficiency. Store and dispense three glove boxes in a single holder. Have the right size available for everyone in a single dispenser. Boxes can be removed and replaced independently leaving other boxes undisturbed. Replenishing your glove supply in two simple steps; pull out the empty box and push a full box into place. The remaining boxes stay in place when the empty is removed to make changes simple and quick. This glove box holder is infinitely adjustable from 7-3/4" to 11-1/4" width to fit all sizes and styles of glove box. When your glove contract changes, make a quick adjustment, and get back to work. No tools required for size adjustment. No need to drill additional holes in walls to accommodate new holders. This holder can also be used to dispense bouffant caps, booties, and other boxed PPE. Constructed of durable powder coated aluminum for cleanability and longevity. Available in neutral color wall mount and Fairfield rail mount. Patented Product. Get everything off the floor with this Universal Container Holder. Most shapes and sizes of sharps containers, chemotherapy containers, and other waste bins are serviced with this one container holder. 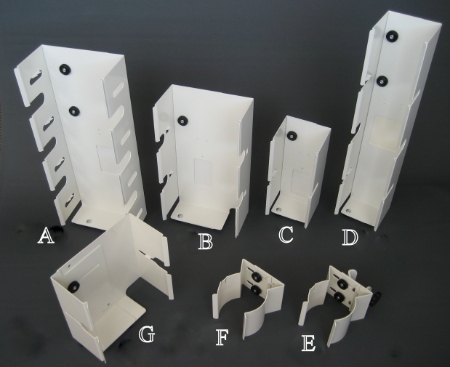 Use multiple Universal Container Holders to create a customized waste station on walls or rails. Any size container from 5 quarts to 8 gallons is securely stored off the floor. Allows use of larger less expensive sharps containers on carts. Constructed of durable powder coated aluminum and Velcro® for cleanability and longevity. Standard wipe methods can be used to disinfect the metal mount while the Velcro® strap can be cleaned by soaking in a low level disinfectant then air drying. No tools are requited to adjust between bin sizes. Available in neutral color wall mount or Fairfield rail mount. Velcro is a registered trademark of Velcro Industries BV. Simple utility glove dispenser. Top load replacement of glove boxes. Securely holds and dispenses any glove box up to 5-7/8" wide by 3-3/4" deep. Open design will not collect debris, allows quick easy wipe cleaning, and great stability for glove boxes. Also available in Double and Triple capacity designs. Use vertically or horizontally.